Even among tomato sauces, there are a variety of authentic Italian flavors that go perfectly with your family's favorite pasta dishes. For a traditionally rich and flavorful tomato sauce, try one of our many red sauce options and see why Barilla is the best jarred tomato sauce for pasta around. Traditional tomato sauce is a perfect complement to any pasta shape, including penne, spaghetti and a key player in lasagna and other baked pasta dishes. 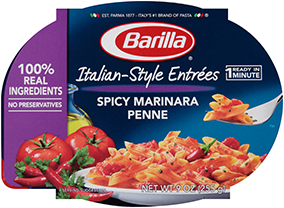 Barilla's flavorful jarred sauce is ready to use - just heat and enjoy!